Scampi sounds Italian, and it is; it’s the plural of scampo, a type of Adriatic lobster-like shellfish. For generations, Italians have enjoyed the simple classic: gamberi alla casalinga (home-style shrimp), which is a straightforward combination of shrimp sautéed in olive oil with garlic, red pepper flakes, and lemon juice. Scampo was also prepared this way. In North America, scampi refers to an Italian-American cooking technique for shrimp, using the gamberi alla casalinga concept plus butter and white wine. Known as Shrimp Scampi, it is one sweet dish. If you choose to, you could accompany this luscious Scampi with a salad and crusty bread; which would be good to mop up the sauce. You don’t have to rent a villa overlooking the Adriatic to enjoy this sensational shrimp preparation, make it soon and enjoy a taste of the Mediterranean. My husband would love this. And back when I ate seafood, I would've, too. I have never made Shrimp Scampi. I really should because my Hubs likes it too. It looks easy enough to make..
Anthony, I didn't know Scampo was the shellfish. I should have because Italian was my language in college and at one time I thought I could speak it. In reality, I probably sounded like Luigi Basko, the little immigrant. Our Italian teacher was so neat. She taught us how to make some great Italian dishes. Taught us to bake that wonderful bread too. Haven't done that in years. Good post. 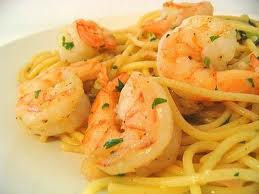 I love shrimp scampi and if I could I would eat it till I burst! A recipe like this I've tried (but no butter and plenty of olive oil) and is very good. L. DIANE: It is delicious, the aroma may make you change your mind. MY JOURNEY: That said, give it a go. MANZANITA: That's great. I make pizza frequently and sometimes make baguettes by taking the risen pizza dough, re-kneading it, forming to loaves and rising again. Makes great bread, which is nice for wiping the empty plate. KALYANI'S PLATTER: It is simply delicious. LEOVI: It's healthier without the butter but I love the flavour. It can be omitted for all olive oil. Thats a lovely looking dish...the shrimp surely will make the taste interesting. KALYAN: Yes it looks nice on a plate and the classix taste is sublime. VARDHINI: Linguini makes me smile. And of course the shrimp can be omitted for a wide variety of vegetable substitutions; the alla casalinga concept will make them too a tasteful delight. Oh my! I can't wait to try this simple dish. Essence of Italy? Perhaps. We brought back a package of hot spice for pasta from our trip to Italy in June. It's just the thing for this dish, I think. Thanks for your visit to my blog. TORVIEW: Thank You Akheela, you are most kind. The books won't be in libraries until people request them. I enjoyed your article on organic dairy farming. JOANNA: Those spices would be great provided everyone at the table likes them. Either way you are bound to enjoy this dish. DR SAMEENA PRATHAP: Hello. By your comment I see you have very good taste. SAMANTHA: This dish is fairly straightforward, give it a go and just get some Windex for the screen. KITCHEN BELLEICIOUS: You're right. Although delicious linguine is a part of this dish, it is so tasty I like crusty bread to wipe the plate clean. Simply delicious recipe. I love the beautiful subtle colors on the shrimp scampi and the pasta.Well done!! MALLI: Thank You, this does have great eye appeal as well as mouthwatering taste. I think fish, garlic and lemon is one of the most delectable honest coming together...and this is much more...you would've enjoyed this meal so much! and imagine having the freshest batch of shrimps! KITCHENMORPH: You are right, this recipe is clean with a classic taste. I'm a six hour drive from the ocean and the gulf so freshest shrimp is hard to get unless fresh-frozen. Thank You for calling and WELCOME BACK! Yum. Such a tasty dish and a great recipe for it. Thank you for all your encouragement with my book, Trouble on Earth Day. My husband rocks! And yes, he makes the most delicious dishes. The scale is my evidence.